Many people don't realize it, they take it for granted, they assume that because it's a Google tool, the numbers must be accurate. But in actual fact the numbers (search volume) that Google's Keyword Planner Tool gives you on search volumes and competitions have never been truly accurate. And now they're set to get even less accurate than before! Google's Keyword Planner Tool is an excellent free keyword tool that can help you to come up with new keywords, keyword ideas, blog post ideas and is usually the first port of call that marketers and advertisers go to before they launch a paid or organic campaign. It can provide you with the amount of times a keyword or keywords are searched each month in Google. But those search volume numbers have always been a little sketchy and never really truly accurate. They are guesstimations that have been rounded off to the last zero. Quite simply, you've always had to take what they tell you with a "pinch or salt". And as it turns out, these search volume numbers are now set to get even more less accurate and precise than they ever used to be! This is because Google has started to combine related terms and acronyms and merge them together to show one bigger number. Google has literally started to bundle together anagrams, acronyms and regional spellings together and come up with some amalgamated number. An example of bundled anagrams, acronyms and regional spellings. This problem of innacuracy could be made even worse with the us of 3rd party keyword tools that don't make account for the changes said Jennifer Slegg from TheSEMPost.com. For those that don’t notice the change – or worse, pulling the data from tools that haven’t updated to take into account the change – this means that some advertisers and SEOs are grossly overestimating those numbers, since many tools will combine data, and there is no notification alert on the results to show that how Google calculates average monthly searches has been changed. This isn't really good for marketers who have been relying on Google's Keyword Planner Tool for knowing which keywords they should most target. And it doesn't appear as though there is any real value and benefit to the end user of it. However this shouldn't really come as a shock because Google is always obfuscating the data it gives out. However this could be a step towards them pushing the fact that people should focus on relevance and context rather than just what the volume of a keyword might be. Web developers, bloggers and writers, advertisers and publishers would benefit from focusing on their CTR and the performance rate of their landing pages instead of jus relying on the numbers. For that, one should use the Google Webmaster Tools Search Console to see how certain particular campaigns are converting. Tallying up your page impressions to those of your paid impressions to get an idea of just how accurate the results that Google's Keyword Planner Tool has given you for whatever keyword term it is you're targeting. One last thing to take into consideration is the seasonal changes. Because some keywords are searched more at different times of the year such as people searching for "Christmas present ideas" around the end of the year as opposed to hardly anyone searching for that during the summer months. So the volumes you're given in Keyword Planner Tool are only approximate numbers that are extrapolated from 12 months of search data that Google holds. It might be better to to cross-reference the data given with Google Trends which can show you spikes for keywords during seasonal changes. Screenshot from Google Trends tool showing spikes each year for "Christmas present ideas". As you can see, there is clearly a spike for this keyword phrase during a certain time of the year. And the results given in Keyword Planner Tool will change with them. Google replaced the Traffic Estimator that would show you both broad match phrase match options about three years ago and a lot of people complained about this at the time. Now that the Keyword Planner Tool is showing a lot less keyword details than before, you should be very wary of the stats it gives you and never take them as set-in-stone gospel. Thanks for the great tips Mike! But I still think Google Keyword Planner is probably the most important tool when it comes to keyword researching both for AdWords and creating SEO optimized content. It may not be very accurate but you can sure figure out the big picture when it comes to keyword popularity. I personally don't need the exact numbers, all I need to know is if a keyword has a few dozen, hundreds or thousands monthly searches. Also, using a number of additional keyword tools and suggestion will better improve on choosing the right keywords for you niche. You're welcome. And yes it probably is. Well no probably about it when it comes to researching keywords and finding more keyword ideas both for paid and organic content campaigns. Just wanted to point this out as there are a lot of people that think the numbers they see and the competition level is accurate when its not. I mean look at the competition level for "search engine optimization" above. It's saying that it's medium level competition but we both no that's not true. One way of knowing whether a keyword phrase is medium level competition or not is by searching it in Google and seeing if there are ads showing for it. 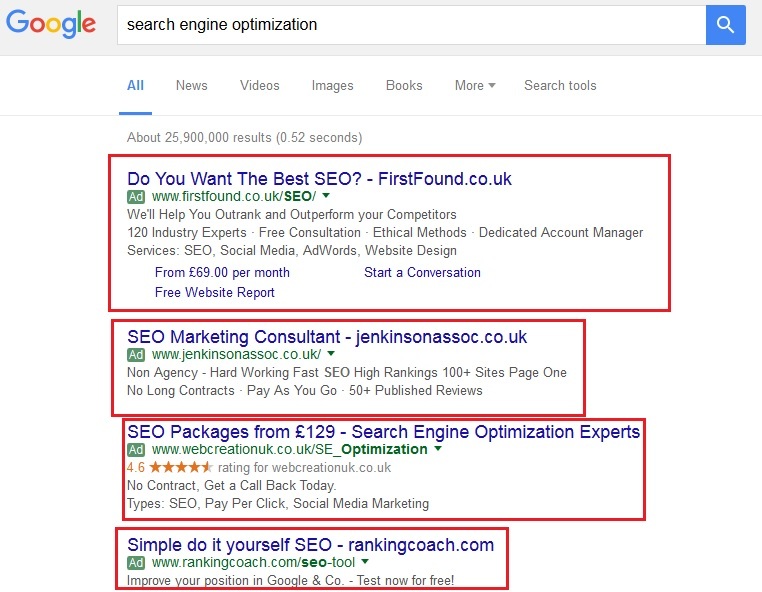 As it turns out, there are 4 ads showing for that specific keyword phrase in Google which shows and proves it's a high competition keyword and not a medium level competition keyword as it say it is. Still though it's a great tool for coming up with keyword ideas and for finding more keywords for things to blog about and target and for keyword research etc. But it should be used in conjunction with other keyword research tools and Google Trends tool to get a more in depth and much more accurate estimation. Hi MIke, thanks for highlighting these important changes that are coming up, I wasn't aware of these changes at all. I honestly still have to go and familiarize myself with the Google Keyword Planner Tool. I did try it out once a few years back. The reason I never continued using the Google Keyword Planner Tool is simply because I heard from a number of sources that it is not an accurate reflection at all of the search volume because it is based on Google Adwords information and not on all Google searches. or that is how I remember what was said. I am not sure how accurate that is but to be on the safe side I decided to rather use paid keyword tools. Thanks for telling us. I use Google Keyword Planner tool because I do not have any other alternative. There are a lot of keyword tools, which may be better than Google tool, however, I have not used those tools because I can use Google tool for free. What is the best tool for xml sitemap? What does "Rarely shown due to low quality score" mean in Google Adwords?